Well, after 4.5 months away I finally got the car back from Garry a couple of weeks since. After managing to screw it all back together I was not happy with the vinyl wrapped reflector and lights so I got those on order from OPC. 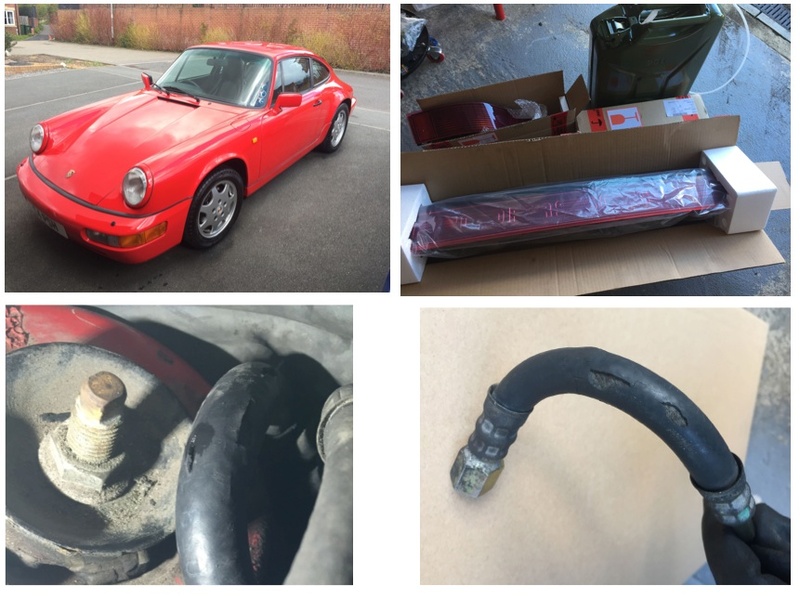 Unfortunately whilst the car was away it developed a fuel leak and on examination I found it to be squirting badly from a perished fuel hose, yes the little hose that is hard connected by tube all the way to the fuel pump. I had already planned to sort the fuel lines as there is a bit of corrosion on the tube bend as it arcs up over the wheel arch. After further inspection today I'm going to replace most of the tube with braided teflon hose, connecting to the tube on the underside (most of the tube is sound) and then running all the way to the filter. Only difficulty may be joining the 10mm tube to the 3/8 tube adaptor but I think I can sort that. Once it is running again the car has to go back to Garry for a final polish and then I'll take it to Chris at Total Detailing for some paint protection. Is that the same fuel line part which DD had a problem with last year? 1980 - 84 924 Turbo with mods. (ex Tony Dron - 12th at Le Mans 1980 with works 924 Carrera Turbo). From memory DDs went on the steel tube, probably the same place as where mine is corroded. Chris does a cracking job, he's done a good few cars for me now including the Porsche last March for my daughters wedding. I could do with getting my Beemer in as the blue should shine up well. So, now I've made my new fuel lines and fixed the leak and had a few weekends play its now time to get back to replacing the suspension. I've been getting all the bolts loose in slow time so that when it comes to the big weekend it will hopefully be less of a fight. Only the big rear bolts still to defeat! My question to those who have done the suspension swap thing, how do I get a baseline set-up in advance of getting the geo sorted ? Do I just fit the H&R springs to the Bilstein B6s as they come out of the box or do I have to make some adjustment to the collar position? I'll be honest and say I haven't read the documentation that comes with the dampers yet . I've read a few DIYs so I'm happy to do the swap just a bit clueless on the set-up. FYI I'm going to try and get Redline at Thornaby to do the geo. Hi Steve. Redline did the geo on my Cayman and I was very pleased with the result. Cheers John, thats good to know. So, I'm making slow but steady progress. Slow mainly because I can't stand to have the car off the road. I thought I'd check my ride heights and corner weights before I change the suspension - just because I like data and have suitable kit around me. A few pics below and I'll publish the data when I get it typed up, quite surprised it was close to book values. Next job is to get the seat piping repaired. I've found a chap on Facebook local to me who is going to replace the piping on the drivers seat and then re-colour the piping on both. I'm not doing anything else on the seats as I quite like the 'driven in' look and the condition is canny. My next choice is wheels, I've 'narrowed' the choice down to….. Outlaw 52 in gold/black - somewhat pricey but they are very pretty. I have even thought about gold D90s! Oops, missed your post Kieth, haven't had a chance to get on here recently. Bit of a set back with the work. I found a guy local to me who (claimed he) could replace the seat piping and recolour the rest of the piping. 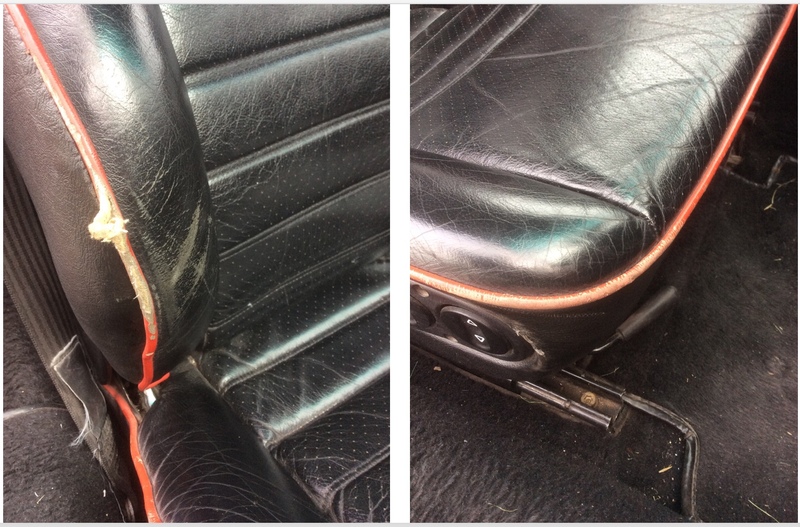 I gave him the back of the seat to take away but when he returned it, after too long, the leather was all puckered along the piping and the centre bit has gone all saggy. I had to pay him off. It's so bad I can't bear to post a picture. Anyway, I've managed to massage it into an almost acceptable condition and it back in the car albeit now on the passenger side to hide it a bit. Keep calm and carry on as the saying goes. I feel for you. That would drive me nuts. Bit of an update on progress as I did little during the summer months and only recently picked up pace. 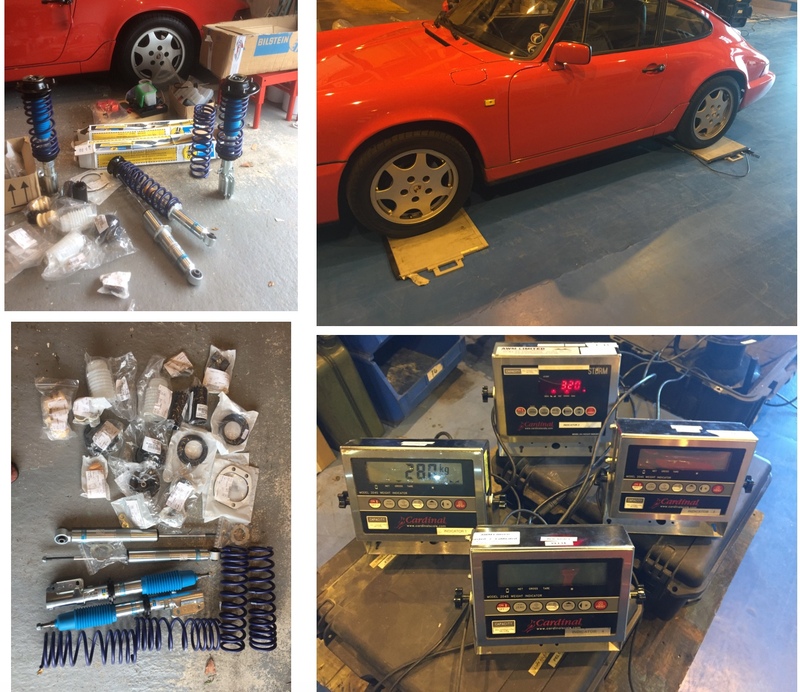 - Replaced rear dampers, springs, top mounts etc etc. - Replaced rear anti-roll bar bushes with SuperPro. - Cleaned and painted rear anti-roll bar. - Replaced rear drop links. - Replacing ball joints now, NS came of easy, still fighting OS! - Bought new wishbone bushes last year but discovered from my service history the current wishbones are only about 20k miles old. Yay! - Decided that all fasteners removed would be replaced with new. - Considering replacing the front diff driveshaft seals whilst I have access as I've a bit of a leak, bought the seals already. - Bought another set of D90s from a lad that works at Absolute VW and posted on Facebook 964 club, they came with remarkably good tyres that I didn't particularly want when I placed my order. I'm going to experiment with wheel colour!!! The application of PlusGas to the suspension parts during the summer months paid off as their was little fighting with nuts and bolts - but the steering parts I changed without prior planning fought very hard. The cars been on axle stands for about 4 weeks now so I'm getting withdrawal symptoms, hopefully I can get it back together next weekend. Progress also hampered considerably by the arrival of a 10-week old Boston Terrier. Also, had my second bi-annual valuation for the agreed value insurance, now at 2.2 x what I paid in November 2012 - which ultimately increases my insurance a tad but it's nice to know. I've loads of pictures but most are how knackered the parts I removed are, I'll post a few when time permits. Hats off to you Steve, she's going to be great! Had my front wishbone bushes replaced a while back with standard powerflex.. boy did I notice the difference straight away , really tightened up the front end . Worth doing but 20k they should still be fine , lots done there Steve , well done . Hope you all had a nice Christmas. - All brake discs and pads (fronts done, rears still to do). I planned, and achieved, getting the car finished before Christmas day (with exception of rear discs) but now I have a problem. Took the car out for first drive with the new shiny bits and I have got quite a nasty vibration under braking(pulsation is a better description I think). It's not a violent shudder but very noticeable. Its speed dependant meaning if I brake from higher speeds the pulse frequency is high and vice versa. I know disc run-out could cause this, even a few microns. I've had the discs off a couple of times to check run out as best I can and, as best I can tell without a dial indicator, they seem okay (I'm measuring with a steel rule from a datum and can't measure any run out). I also checked run-out of the hubs. I noticed as I was putting the discs back on this afternoon that the front anti-roll bar does not seem to be seated properly in the bush - and the bush is probably past its best. I didn't change these during the works as I could not see how to get access to the front-most clamp bolts without major work. So, would the front anti-roll bar not seated cause this vibration? I can't be helping but I can't help thinking that something rotational is the cause? Has anyone changed the front bushes and is it a PITA? With having changed so many bits I'm a bit perplexed as to where to start other than the bush. I would say discs would be the most likely culprit. Also, what pads are you using? I had some Pagid yellows (for track work) which were a bit iffy until they were fully warmed up. I changed them to a more suitable pad for roads. However, I had a Subaru Impreza and the wobble under braking turned out to be a badly fitted suspension mount. Hi Steve, if the pulse through the pedal is only under braking I would start with the discsbut don't count out the front calipers either. Check the discs are seating properly, what happens when you spin the disc, dose it jam in the pads? I have two spare new front discs if you want to borrow them? Discs although not used, were bought second hand with a bunch of other parts, mainly the refurbished hubs. Ian - I tried spinning the discs and there is a slight tight spot on both discs. I guess this is the cause but I don't yet know if it is the discs or the refurbished hubs that has run-out. Thanks for the offer of the discs. I may just get some new as I can just pop to Team Valley - time is of the essence. Today I re-seated the anti-roll bar without any change to the judder. Think I might try replacing the discs first as this is quite easy even if it costs a little bit. I'm hoping it's not the hubs but thankfully I still have the originals (all other parts removed have been binned).